This large bountiful cut of pork makes an excellent, beautiful entree for almost any occasion. Apart from its stunning presentation, this recipe has sweet and salty flavors that pair together harmoniously to appeal the senses on multiple levels. When accompanied with the right sides and paired with the perfect wine, you'll be looking forward to a night of elegant visuals and good eating. 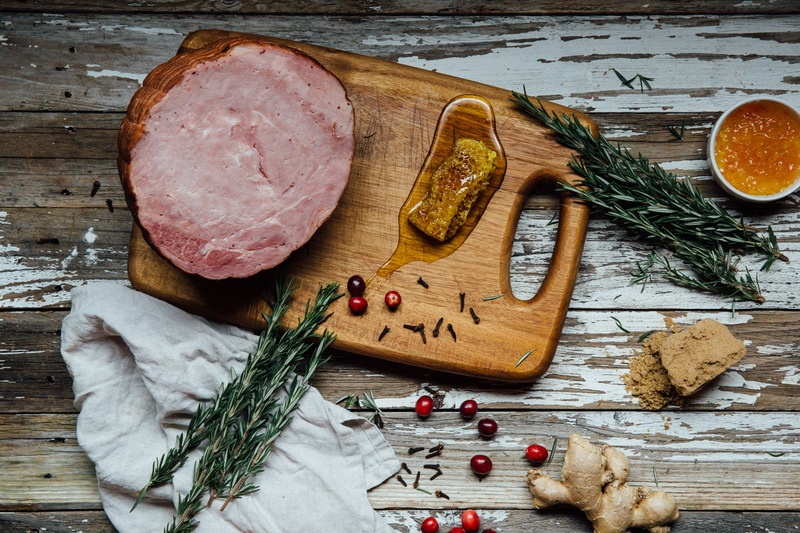 Press scattered cloves into the skin of the ham then place the whole thing in a baking tray, surrounding with rosemary. Bake for 20 minutes. Meanwhile, heat the marmalade and rosemary leaves together in a small saucepan until they simmer. After the ham has been in for 20 minutes, pour 1/2 of the glaze over the top, spreading it evenly with a pastry brush, spoon or a little branch of rosemary. 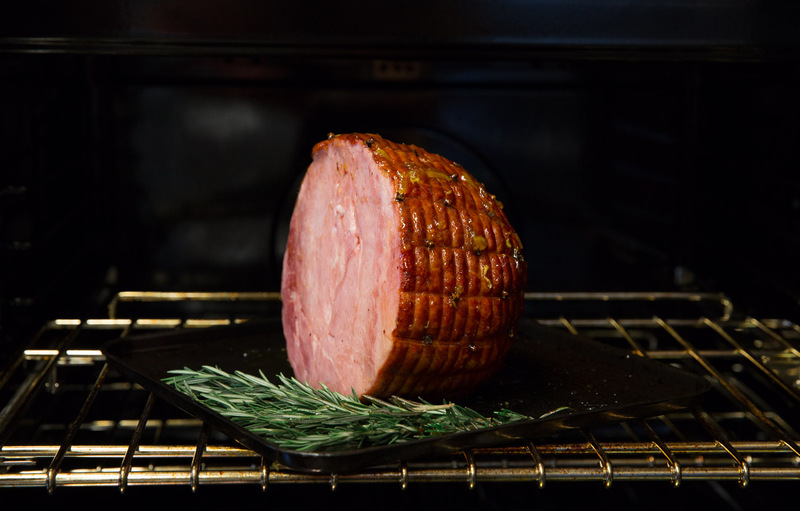 Return the ham to the oven, turning so the front goes to the back for another 20 minutes. Smear the remaining glaze, and Bake for another 20 minutes, turning again. After the ham has been in for 1 hour, remove and baste by scooping the juices from the bottom of the pan and drizzling over the top. Bake for another 20 minutes, remembering to turn again. After the ham has been in for 1 hour 20 minutes it should be done. You're looking for it to be lovely and deeply caramelized on top. If not, continue to baste and check every 10 minutes until well colored. 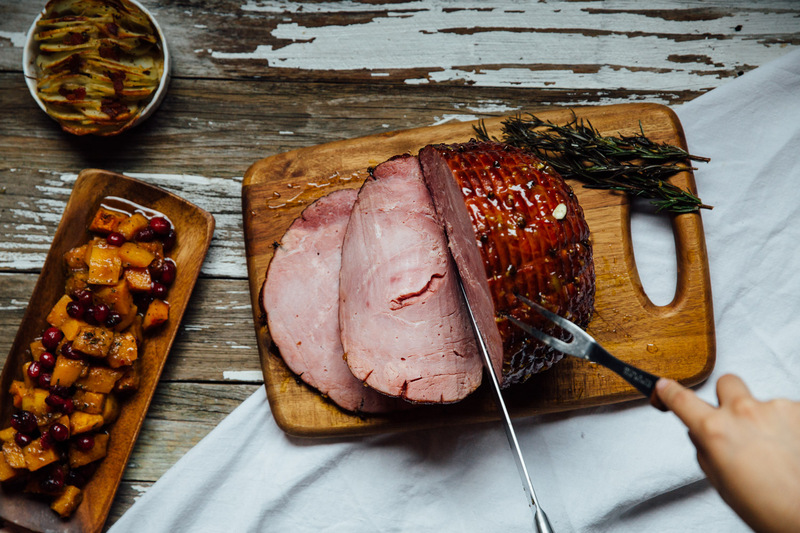 Once your ham is ready, it should have a shiny glazed texture and sweet orange and pork flavor. Serve hot or at room temperature and enjoy! Premier Meat Company knows food is about quality and not quantity. So even with our most giving cuts, we curate recipes that are delicious by any standards. Stay in the know of our newest recipes by following our Twitter and like us on Facebook! Or if you just can't get enough pictures of food, check us out on Instagram for a daily helping.